Subaru of America is on the road again with outdoor outfitter REI to meld the two entities love of the great outdoors with thousands of like-minded outdoor adventurers and enthusiasts. Across the country this summer dozens of REI events are underway where Subaru is showing off its 2019 Subaru Ascent. It is hosting plenty of activities to draw in new customers while also showing its appreciation for existing owners. At the center of it all is a sweepstakes offering the chance to win one of the new vehicles—equipped with REI gear—giving Subaru the opportunity to collect consumer information for re-marketing. Subaru makes itself known at REI events like this well-attended outdoor retreat. 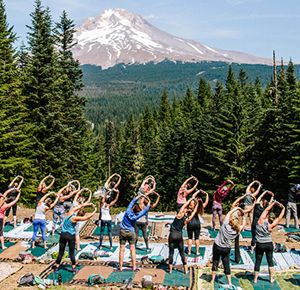 To make that happen, Subaru has a presence at the REI Outessa Series, which includes outdoor retreats and music festivals designed to grow and strengthen the community of women in the outdoors. The brand is also making stops at a dozen REI retail locations through it Subaru-branded road trip. Subaru will have a presence at the two, one-day Outessafest music festivals on Sept. 29 in Patuxent River Park, MD, and on Oct. 20 in Shakori Hills, NC, providing the opportunity to showoff its new Ascent and engage with people through the sweepstakes. Inspirational speakers, female-led performances and adventures with REI Outdoor School instructors such as yoga, rock climbing, paddling and running are all part of the festivities. Last year, Subaru tested its presence at the Outessa retreats. It will be back this year, returning to Waterville Valley Resort in New Hampshire Sept.13 – 16 and it added on the immersive weekend at Squaw Valley Resort in California, which took place Aug. 2 – 5. Each retreat features guided workshops in iconic locations that are often attended by hundreds of women. One unique element to the events is “aura” photography that resonates with young, health-focused females. Aura photography plays on the idea that everyone has an aura, or field of energy that surrounds them. An aura photographer is onsite at some of the events using biofeedback technology to take photographs of attendees that reads their electromagnetic field that emanates a rainbow of colors specific to that person. There is also keychain making and VIP parking for Subaru owners. Subaru will also hit 12 REI retail stores across the country this summer as part of its “Subaru Road Trip at REI” series. The series began July 20 in Seattle showcasing the 2019 Subaru Ascent, as well as other vehicles in the Subaru fleet for REI customers to explore first-hand. The brand will activate camping-themed giveaways and other promotions, including the sweepstakes to win an Ascent. For example, customers who buy any reusable cup will receive complimentary roadside refreshment from the Subaru “camp host.” Subaru owners will receive a limited-edition camp cup. After stops in Austin, TX, Jacksonville, FL, Washington, DC, and other locations, the road trip ends Nov. 9-11 in Kalispell, MT. Subaru is participating in the REI’s campouts staged at unique sites across the country like Angel Island, CA, and Camp Bullfrog Lake, IL. At each of the 11 locations Subaru will be set up to offer attendees gourmet food and beverages, activities like evening entertainment, car camping tips and the sweepstakes offering a chance to win a the Ascent equipped with REI gear. The campouts end Oct. 28 at Unicoi State Park in Georgia. To understand the ROI of the events, Subaru collects opt-ins and tracks leads, but doesn’t consider that its top measurement.